This is a very beautiful production and moving rendition of Amazing Grace. I especially like the bagpipes and the setting — which looks like the Colloseum in Rome. It starts out slow but really gains momento and decibels once these guys get going. Click here and enjoy! OK, I’ve had enough. 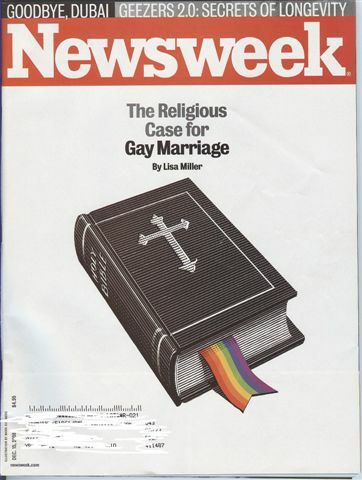 This week’s cover story in Newsweek is the straw that broke the camel’s back. I will no longer support this kind of crap nor allow it in my house. If they want to publish this kind of propoganda story they can find someone else to buy their lousy rag of a magazine. 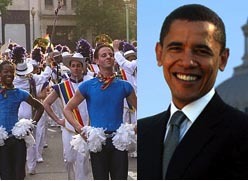 Washington DC, Dec 10, 2008 / 04:48 pm (CNA).- President-elect Barack Obama and Vice President-elect Joe Biden have officially invited the Lesbian and Gay Band Association to march in the Inaugural Parade. One of the association’s web sites reports that the group will also march in September as part of the homosexual “Southern Decadence” festival infamous for its public lewd acts. The Lesbian and Gay Band Association (LGBA) is a network of lesbian and gay bands comprised of concert and marching bands from various American cities.